Paperback; 121 pages. 2008. Specific tools that enhance the patient experience and address the difficulties staff have in delivering the exemplary care they would like to provide. 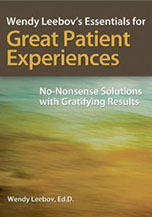 High-impact strategies for moving your service excellence and patient satisfaction to a new level, resulting in higher scores on CAHPS, Picker and Press-Ganey surveys.